It was indeed memorable to organise an inauguration of a brand new MBA batch at the Postgraduate Institute of Management (PIM) in the United Arab Emirates (UAE). It was encouraging to see the spirit of Sri Lankans in Dubai who actively supported our endeavour in bringing in management learning to Dubai with what we call “global reach with local roots”. Today’s article is all about it. The obvious reason for Sri Lankans to go to Dubai is to earn. We had to shift that paradigm. It is not only to earn, but to learn. I in fact suggested to them, that it should be earn, learn and return. That’s where PIM MBA will be handy. It was last Thursday that we had the MBA inauguration in Dubai. The PIM alumni (PIMA) chapter of UAE played a commendable role in organising the event. Parakrama Munaweera, who was instrumental in bringing Sri Lankan study programs to UAE shared his reminiscent memories. He commended the team effort of the Sri Lankan managers in Dubai for opting to embark on a study program offered by a Sri Lankan higher education institute. Ajantha Premarathne, the President, and Deepal Rajaguru, the Secretary of the PIMA-UAE chapter are two names worth mentioning for their commendable effort. It reminds me what Dr. Travis Perera, Senior Consultant, PIM has been telling about MBAs. They are, in a way, consumers of PIM, receiving the education from us. At the same time they are co-producers of knowledge and skills. Hence the term borrowed from the marketing echelons, prosumer aptly demonstrates their nature. Thus, we have a batch of 40 prosumers in Dubai. From the process point of view, outcomes and outputs are good only when the inputs are good. That’s why I am happy that I sat, together with Jayantha Ranapura, our Senior Assistant Registrar, to conduct interviews of candidates who passed the admission test to get selected for PIM’s MBA. The practice of enrolling anyone who walks in is for “study shops” and definitely not for us. Being the pioneering MBA in Sri Lanka and hailed as the best consistently, PIM has a challenge to continuously improve. With rapid technological advancements, the need to have blended learning with the use of ICT tools is on the rise. Also, greater flexibility from the students as well the high standards from the institutions need to be maintained with proper balancing. We have realised the need to ensure quality and relevance at all times. The increasingly competitive challenge is to enhance our prosumers. As it was clearly seen by the responses of our MBA aspirants, the need for cutting-edge knowledge with global presence and local pulse is what needs to be fulfilled. Having a monthly presence by a Sri Lankan resource person in physically conducting lectures, supported by video conferencing and other e-learning tools will be the way forward. The PIM’s MBA inauguration in UAE last Thursday, prompted me to move down the memory lane. I indeed went through that transformational experience. As I started off as an Engineer and then switched over to management, I realised that MBA would train the learner with a holistic view of a situation. In brief the learner will be able to enhance the functional knowledge through a cylindrical view to broad business knowledge through a conical view. This “interconnectedness” transforms the learner to appreciate other functions with a broader prospective or holistic view of the business. A good MBA curriculum should consist of business realities, challenges, new ways of looking at issues and produce out of the box solutions. From my own experience at PIM in talking to the alumni of MBA holders their single biggest factor in what makes them stand out among fellow peers is the “self-confidence” they have gained in experimenting, creating, innovating new pathways and questioning the traditional way of doing things. As a result MBA inculcates a mindset to tackle issues in an innovative and integrated manner. Simultaneously, being an MBA will enhance the market value of a person. As for the entrepreneurs, they will have professionals producing value for their organisations in a sustainable manner at the end of the day. The ultimate outcome is the birth of a powerful social network sharing calibre and leading to dynamic forces within organisations and of course pursuing higher benchmarks in professionalism. The curriculum of a MBA is critical in producing professionals. Thus the success of a MBA programme depends on the aspects such as “the knowledge factor”, the “skills factor”, “attitude transformation” and the “time dimension”. To elaborate under the knowledge factor an MBA curriculum should be up to date with the cutting edge knowledge and the seminal or the essential body of knowledge. Secondly under the skills factor an MBA must inculcate or enhance skills in analysis, application, documentation, presentation, problem solving, relations building, negotiation and leading which are few of the essential skills in bringing professionalism to work. Thirdly the most critical aspect as for me is the “attitudinal dimension”. Speaking from my own experience becoming an MBA is changing a person’s own attitude to fundamentally challenge and stretch one’s self. In other words enhancing one’s capacity to cope with many fronts and priorities and thus maintain work-life balance. This aspect reiterates or complements the aspect of enhanced self confidence in an MBA holder. Finally the time dimension is as important and must cater for strategic and operational aspects of the business for sustainability in the long term. Equally as the educational thresholds are ever going up, the Accreditation system and Quality assurance are of paramount importance in offering a standard MBA. I tend to think that the success of an MBA program reflects essentially on its alumni. 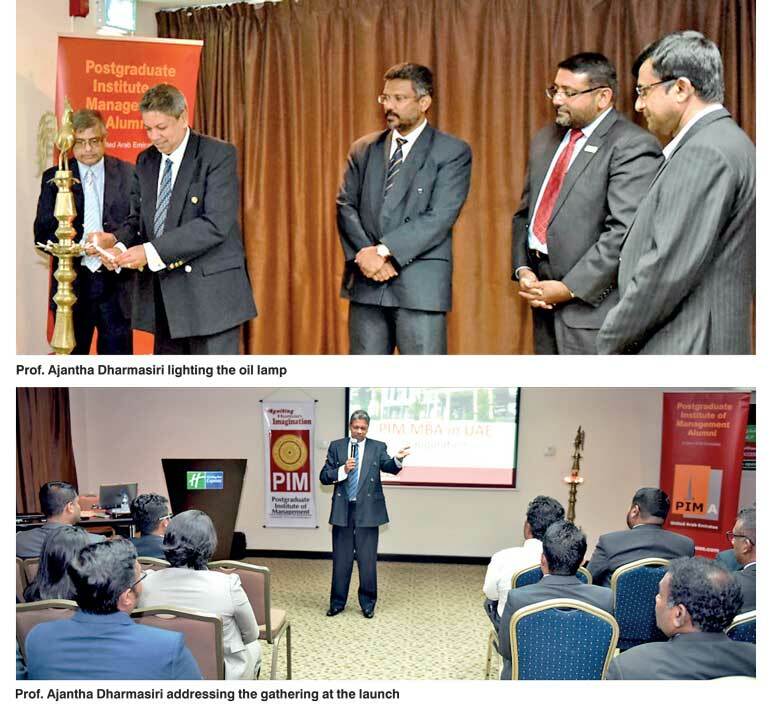 It gives me pride in stating that PIM, being the pioneering MBA offering institution in Sri Lanka, has so far produced around 100 CEOs and 1,000 directors. It highlights the value of MBA with its quality and relevance, locally as well as globally. There is a wave of criticisms on MBAs around the world. Especially after the global credit crunch and the collapse of giants led by MBAs, this negativity has gathered momentum. I myself have heard from CEOs lamenting that some of their MBAs know a lot of theory but sadly lack the practical approach in applying them into real issues. Taking this issue into a broader perspective, an ongoing debate in the USA has even reach a point to say that MBA awarding business schools have an identity crisis. I am confident that we will not allow that to happen to us. Yet, it is better to be proactive than being reactive. According to Forbes magazine, Business schools have always juggled two missions: educating practitioners and creating knowledge through research. Fifty years ago, as explained in the 2005 HBR article How Business Schools Lost Their Way, business schools shifted their focus from the former to the latter. Management became a science rather than a profession. This shift had profound implications. Business schools rewarded professors for publishing their research in academic journals, and their curriculum began to reflect the narrow focus of the faculty. Business school professors became increasingly disconnected from practicing managers and leaders. By the mid-2000s, it became clear that business schools had swung too far in one direction. Being conscious of these developments have prompted us to strengthen our practical approach with necessary frameworks. It is not only “know what” but “know why” and “know how”. For an example, every research our students do, it is mandatory to elaborate on managerial implications and practical applications. I would like to quote the famous author Aldous Huxley here: “At the end of the day what matters is not how much you know but how much you have done.” Simply, the MBA should not be limited to a paper qualification. The purpose of the MBA is to produce professionals not theoreticians. This is exactly where “having an MBA” differs to “being a MBA”. Being a MBA will bring out professionals who will possess a holistic view of a situation and hence will innovate new ways of thinking through the ability to think on feet and apply knowledge more systematically. An MBA will always bring new ways of doing things to the table and deliver results for long-term sustainability of an organisation. Thus, MBA is essentially employability and what is best, professionalism. MBAs should never be Mentally Below Average. It should always be Mind Before Action. It reminds me of what Asian wisdom has taught us, the ‘Seeing-Doing’ nexus. “Samma Ditti” (right seeing) should lead to “Samma Vayama” (right action). Being brilliant as an MBA helps the learner to see things clearly and do things cleverly. That’s what we require in a turbulent world with chaotic competition all over.